I know that Fett is simply a repack from the Fett Evolutions set, but wouldn't that make this the first single carded Fett with a removable helmet? 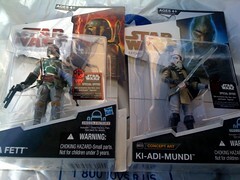 I have a tonne of Fett's and none of them have a removable helmet other than the one included in the Evolutions set. The figures that interest me here also happen to be all the figures that come with green droid pieces. Assuming I find them all, that would make my first completed BAD. I'm also considering that Boba Fett, since the only Boba I have is the buff one from the mid 90's. LOL, I have that one! It's great! And mine is signed by Jeremy Bullock too! Doesn't get much cooler than that! This Boba Fett is 100% x paint accurate over the evo pack!! I have the evolutions and now this one the evolutions is a poor excuse of Fett LOL!!! I have 30th aniversary Boba fett sighned by Jeremy Bullock. The fett in this wave isn't a re-releass of that one is it?